Scroll down to see the top not-for-profit colleges offering fine arts degrees online. Students with an interest in modern art can earn a Master of Arts in Modern Art History, Theory, and Criticism entirely online at Azusa Pacific University. This is a 12-course program that students can complete in as little as a year and a half without ever having to attend meetings or events on campus. This degree prepares students for careers such curating art, museum work, or teaching. Artists who enjoy teaching may also be interested in Azusa Pacific's newest online program, the Master of Arts in Arts Education, a low-residency program that will require two week-long intensives on the APU campus. Bellevue University offers an online Master of Fine Arts in Creativity that is designed to help students make a career of their art by adding classes in entrepreneurship to the traditional M.F.A. classes focusing on art. The program defines "art" in a broad sense, so the program is open to students who are interested in fields such as public art, costume design, architecture, graphic art, or writing. The curriculum includes two on-campus residencies, which span 10 days, and two virtual residencies. Students are also required to complete seven core courses and to complete a thesis, project and presentation. Courses cover topics such as art and value creation, art market awareness, small enterprise basics, and creativity and technology. The online arts program at Edinboro University prepares artists to be teachers or art therapists. The Master of Arts in Counseling - Art Therapy is a 60-credit program that can be completed 100 percent online. Graduates are eligible to become a registered art therapist and a licensed professional counselor in Pennsylvania. Applicants must have at least 18 credits in studio art and at least 12 credits in psychology classes at the undergraduate or graduate level. A Post-Master's Certificate in Art Therapy and a Master of Arts in Art Education are also offered in an online format. Edinboro's graduate education programs were among the Best Online Programs in the 2017 U.S. News and World Report college rankings. Students can earn a bachelor's degree or graduate certificate in visual arts through Harvard University's Harvard Extension School. The Visual Arts Graduate Certificate requires three courses and can be completed entirely online. The undergraduate degree is a Bachelor of Liberal Arts in Visual Arts. This program requires students to "earn their way in" with an admission process that requires them to successfully complete three courses for the degree before applying to the program. The bachelor's degree requires 128 credits. While many courses are offered online, students must complete at least 16 credits on the Harvard campus. Options include a full-time semester on campus, online courses that require a weekend on campus, or three- or seven-week classes taught at Harvard. Indiana University of Pennsylvania has a blended program leading to a Master of Arts in Art that is designed for working art teachers who want a studio-focused degree. This is a 30-credit program with classes offered online in the fall and winter, when teachers are working, and on campus over the summer. For this practice-oriented degree, students choose an area of study: painting, drawing, jewelry and metals, ceramics, sculpture, or wood turning and furniture design. Candidates develop a studio project and take part in an exhibition. Applicants must have a degree in art (Bachelor of Arts, Bachelor of Fine Arts, or Bachelor of Science in Art Education). This program is also appropriate for teachers seeking PDE Level II certification. The Institute of American Indian Arts offers an online certificate in Native American Art History. This program is interdisciplinary, including historical overviews of the art of Native Americans, First Nations, and the indigenous peoples of Central and South America. Students use a variety of disciplines to examine art, including archaeology, anthropology, and art history. This is a 30-credit program with 18 credits in required core courses and 12 credits in electives. As part of the program, students will learn about oral history research and other research methods. Mansfield University of Pennsylvania has an online degree-completion program that leads to a Bachelor of Arts in Art History. All of the art history courses for the degree are offered online. Students must also complete 55 credits in general education coursework and 35 elective credits. Students can choose to complete their general education credits elsewhere and transfer them, because online choices for these courses can be limited at Mansfield. Students may attend this program on a full-time or part-time basis, although courses that are not related to the art history major are most often offered over the summer. Northwestern State University of Louisiana has a Master of Arts in Art that is a low-residency online program. The degree requires 33 credits, and students may take as many as 27 of those credits through distance learning. Students are required to attend either one semester on campus or two three-week summer sessions on campus when they begin working on the degree so that they can become familiar with the faculty and facilities. The graduate thesis exhibition also needs to take place on campus, and students usually do this during a three-week summer session. Applicants should have studied art as an undergraduate and must submit photos of their work. The Pennsylvania Academy of the Fine Arts has a low-residency Master of Fine Arts program that combines online courses in the spring and fall with three eight-week intensive summer sessions held on the campus in Philadelphia. When on campus, students have their own private studio for independent work. Students start the program in one summer and complete it at the end of the third summer, with candidates producing a visual thesis. Incoming students receive an iPad that they will use to document and share their work while they are off campus. They receive training in using the technology during their first residency. Radford University's online graduate programs include the Master of Fine Arts in Art Design Thinking Concentration and the Design Thinking Graduate Certificate. Students in the two-year MFA program learn to use the process of design to tackle international issues and complex problems. It's an interdisciplinary degree that encompasses courses such as design theory & research, instructional design & evaluation, and environment behavior. There are multiple hands-on studios, including work on client projects. Students are not required to have a degree in design or art to enroll. Need something a little shorter? The one-year, 15-credit graduate certificate is a condensed version of the MFA curriculum. Students take the Design Thinking Studio and four out of five courses in relevant subjects. Credits from the certificate can be easily transferred to the MFA if you choose to pursue it at a later date. The Savannah College of Art and Design, or SCAD, offers a variety of online programs for students who want to earn a degree in the fine arts. Some of the degrees available online include a Master of Arts and Master of Fine Arts in Animation, Bachelor of Arts in Sequential Art, master's programs in illustration, undergraduate and graduate degrees in photography, and an M.F.A. in Painting. Most classes are offered in an asynchronous format where students log in at a time that is convenient to them to do coursework and comment on class discussion boards. Online classes are offered on a 10-week schedule, the same calendar used for SCAD's traditional classroom courses. SUNY Empire State College has a host of distance learning options for students interested in fine arts. At the undergraduate level, there's a 64-credit online Associate of Arts and Associate of Science in the Arts, as well as a 124-credit Bachelor of Arts, Bachelor of Science and Bachelor of Professional Studies in the Arts. For all of these degrees, you can choose from various visual & media arts concentrations, or create an interdisciplinary concentration in your area of interest. At the graduate level, SUNY has developed a 36-credit online Master of Arts in Learning and Emerging Technologies: Emerging Media and Technology for the Arts and a shorter online Graduate Certificate in Emerging Media and Technology for the Arts. These programs are built for art educators, instructional designers, and teachers who wish to combine arts-based methodologies with emerging media and technology. University of Florida's MA in Art Education admits students with baccalaureates in Art Education, Art, or Art History. That's because across the span of two years, students delve back into each of those areas before embarking on a six-credit, research-based capstone. The 36-credit program is completely online, although enrollees may take advantage of optional Summer Studio sessions on campus. The innovative MA in Arts in Medicine (also available as a Graduate Certificate) accepts students with health or art backgrounds who want to use art as a treatment approach. Students complete a practicum as part of the 35-credit curriculum. The University of Nebraska Kearney's comprehensive Master of Arts in Education - Art Education has two possible emphases (Museum Education and Classroom Education), both of which can be completed 100 percent online. The 36-credit degrees have different core requirements, but coursework always puts a substantial focus on curriculum development and teaching methods. All students choose 18 elective credits from a range of interesting topics before completing a research methods course and final research paper in their chosen area. A bachelor's degree in art education or visual arts is a prerequisite to apply. The MEd does not grant certification or licensure to teach art in K-12 schools. When it comes to an online degree in fine arts, it helps to know the territory! For the money you’re paying, you deserve an affordable and accredited program that will provide plenty of hands-on experience, studio time, and career preparation. If you’re thinking about teaching or art therapy, you’ll also need to know whether the program fulfills your licensure requirements. We guide you through the entire process below. Are you torn between online and on-campus? Have a quick look at our page on Affordable Fine Arts Degrees. Even if you don’t live in a major city like LA or NYC, you may still be able to find a great program in your neck of the woods. 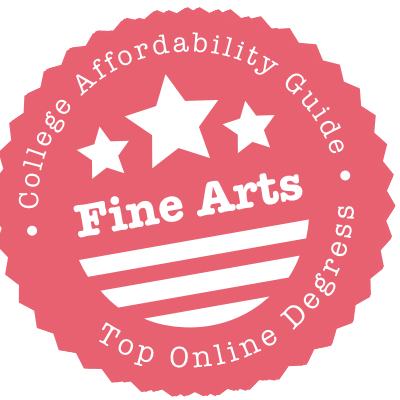 This page also includes a rundown on fine arts degree titles and a handy checklist for picking a BFA or MFA Program. Can You Find One? They’re scarce, but they do exist. For instance, SUNY Empire State College offers an Online AA or AS in the Arts in various concentrations (e.g. fine arts, performing arts, creative writing, media arts, etc.). Make sure the program includes opportunities for applied coursework. Can You Apply Credits for Work Experiences? SUNY Empire State College, for example, accepts credits for college-level learning acquired through military training, CLEP, DSST, PLA, and more. The more credits you can apply to the program, the lower your tuition. Will Your Online Credits Transfer Easily to a BA or BS? Check the transfer policies before you sign on the dotted line. In the future, you may want to apply your online associate degree to a hybrid, online, or on-campus bachelor program in the arts. Research your options and talk to colleges. Will your favored academy or design institute accept your online AA credits? Is Online Learning a Good Choice? Art is a hands-on profession, so think carefully before you commit to a 100% online degree. Take a course tour, talk to former students, and ask how students can collaborate on projects. You’re likely to find more online choices in colleges devoted to art. For example, Savannah College of Art and Design has online bachelor programs in Graphic Design, Interactive Design and Game Development, Photography, and Sequential Art. Should You Choose an Online BA or BFA? Generally speaking, a BFA will train you to become a professional artist while a BA has applications to other fields (e.g. BA in Art History, BA in Museum Studies, etc.). Because of the training involved, online BFAs are rarer than BAs. Do your research before you decide to invest in one. Can You Customize Your Degree? If you have a particular field (e.g. painting) or career (e.g. media) in mind, you may be able to pick & choose electives that will prepare you for the road ahead. For instance, SUNY Empire State College allows you to customize an Online BA, BS, or BPS in the Arts with all kinds of concentrations. Is it a Hybrid/Blended Program? Online fine arts degrees often include on-campus classes where you can work in studios and receive advice on projects. For example, students in the Harvard University Extension School’s Hybrid Bachelor of Liberal Arts in Visual Arts must complete at least 16 credits on the Harvard campus. Is it a Degree Completion Program? In this kind of set-up, you’ll be expected to earn your associate’s degree elsewhere and transfer your credits into the last two years of an online bachelor’s program. To take one example, Mansfield University of Pennsylvania has an online degree completion program that leads to a BA in Art History. Do You Want to Teach K-12 Art in Public Schools? If so, 100% online degrees won’t cut it. To earn your initial teaching licensure/certification, you’ll need to find an on-campus or hybrid program in education, art education, or even a double degree in education and art. These programs will always include in-person training components (i.e. internships and classroom observation). We talk about this in our section on Licensure (see below). Can You Apply Previous Academic & Career Credits? Schools will spell out their terms on their website. For instance, at SUNY Empire State College, up to 93 credits of college-level learning may be accepted as transfer credits. If you have completed an associate degree from a SUNY or CUNY community college, you may transfer the whole degree into an Empire State College bachelor’s degree program with up to 79 lower-level credits. Can You Specialize? There are plenty of career-focused choices at the master’s level! Think Savannah College of Art and Design’s Online MA or MFA in Animation; the University of Florida’s Online MA in Arts in Medicine; Radford’s Online MFA in Art Design Thinking; or Bellevue University’s Hybrid MFA in Creativity that adds classes in entrepreneurship. You don’t have to settle for a generic degree—find the one that suits your goals. Is it a Low Residency Program? Be aware that many online master’s programs in art education & fine arts will require you to be on campus at some point. For example, the Pennsylvania Academy of the Fine Arts has an MFA that includes three eight-week summer sessions in Philadelphia; Azusa Pacific University’s MA in Arts Education has two week-long intensives in California; and Indiana University of Pennsylvania’s MA in Art bunches its on-campus courses over the summer. Budget for travel! Can Any Online Degrees Help with Teaching Licensure? The answer is “maybe.” Art teachers in K-12 schools sometimes pursue a master’s degree to fulfill the education requirements for advanced licensure/certification or field endorsements. A few online graduate degrees in teaching will help you achieve these goals; many others will not. In either case, universities should state the facts clearly on their program websites. We talk more about the issue in our section on Licensure (see below). What is an Online MA in Art Education? This degree is often aimed at current K-12 art teachers and art educators in relevant fields (e.g. museums). It can help with career advancement and applications to administrative jobs, but it usually cannot be used as an alternative pathway to teacher licensure or to earn endorsements. For example, to apply for Edinboro University of Pennsylvania’s Online MA in Art Education, you must already hold a bachelor’s degree in art education (or a similar field) and be licensed/certified to teach art. Have You Considered Art Therapy? Art therapy uses creative methods of expression as therapeutic techniques. We talk more about the field in our section on Licensure (see below). But it’s useful to know that there are online & hybrid programs that can help you prepare for the field. Edinboro University of Pennsylvania’s NASAD-accredited MA in Counseling – Art Therapy is just one example. Does it Prepare You for Professional Certifications? Are you interested in using your master’s degree to earn voluntary qualifications? Check with the university to see if the coursework will be relevant. For instance, Pennsylvania State University’s Online MPS in Art Education is designed to help you prepare for certification by the National Board for Professional Teaching Standards (NBPTS). Does it Appear in Online Education Rankings? U.S. News & World Report doesn’t dig into online fine arts programs, but it does provide detailed rankings for the Best Online Graduate Education Programs. Be sure to look ’em up if this is your interest. Can You Find One? In most cases, the MFA is regarded as a terminal degree—that is, it’s the highest qualification you need to teach in higher education (i.e. university). On-campus DFAs are rare, so it may be impossible to find an online version. You’ll have more choice in education-related fields. What Area Do You Want to Specialize in? An online certificate in fine arts is typically short and super-targeted. For example, the Institute of American Indian Arts offers an Online Certificate in Native American Art History and Edinboro University of Pennsylvania has developed a Post-Master’s Certificate in Art Therapy. Since certificates don’t qualify for federal financial aid, you may want to opt for a career-relevant program that is eligible for employer reimbursement. Will Your Credits Transfer to a Degree? Remember, too, that you may want to move your credits into a degree program at some point in the future. For example, Radford University’s Online Design Thinking Graduate Certificate is structured so that course credits will easily transfer to Radford’s MFA in Design Thinking. Can You Enroll if You Live Out-Of-State? Most universities have great reciprocity agreements (e.g. NC-SARA) that allow students from other states to enroll in their distance learning programs. Exceptions to this rule usually concern programs that have clinical or fieldwork components (e.g. nursing). For example, Mansfield University programs that lead to professional licensure are not authorized to be offered in Iowa. You’ll find details on the State Authorization page of the university’s website. Does the Program Fit With Your Schedule? Some online fine arts programs will include synchronous components—that means you have to be at your computer at a certain date and time to participate in the course. You may also need to set aside some time for class activities. For example, students in Savannah College of Art and Design’s eLearning courses are expected to participate in all assignments, exams, and field trips or other special activities as directed by the professor. What is the Credit Transfer Policy? Every university has their own quirky policy on credit transfers. In most cases, you won’t have any problems transferring academic credits from a regionally accredited school, but it’s always best to check. Graduate schools, in particular, often have a cap on how many credits can be moved into a master’s program (e.g. University of Florida accepts up to 9 semester credits of graduate-level work, earned with a grade of A, A-, B+, or B). Who is Teaching Your Online Course? A number of your courses in online and hybrid fine arts programs will be taught by adjunct professors who are currently working as professional artists. We think this is great—as long as they know how to teach! Explore their websites & exhibitions, examine their LinkedIn profile, check student reviews of their classes, and talk to them beforehand. Finding the right mentors is a superb way to build your career. Is the Coursework & Training Relevant? This will be a personal choice. You may be comfortable working on your own, with a virtual advisor providing guidance. Or you may decide that you need a hybrid program where you can work in a studio alongside your instructors. How Does the Program Support Online Students? Online work is challenging, especially when it comes to fields that involve applied creativity. Demand to know how the school intends to support you through the journey. Is tutoring available for General Education courses? Do you always have access to your instructors? Is the online classroom easy to navigate? Distance learning awards from organizations like the Instructional Technology Council (ITC) are nice to see. Are There Hidden Costs? Read every word of the tuition & fees section. Even if you don’t have to pay for campus facilities, schools love to tack on fees for distance learning or technology. And in art, you’ll often be expected to pay for your own materials & software. Some schools are willing to help out with these costs. For example, the Savannah College of Art and Design provides a variety of free tools and downloads to fully enrolled eLearning students. Is Financial Aid Available to Online Students? The general rule is that online undergraduate & graduate programs, from regionally accredited institutions, will qualify for federal financial aid (e.g. government loans, grants & scholarships). However, non-degree programs such as graduate certificates will not. We always recommend a virtual visit to the Office of Financial Aid. In addition to details on university (i.e. institutional) aid, the Office will have advice on how to apply for external funding (e.g. outside scholarships, employer reimbursement programs, etc.). Do Online Students Receive a Tuition Discount? Remember that public and state universities often offer substantial tuition breaks to online undergraduates (and sometimes to graduates) who reside in the state or in neighboring states. Other universities give tuition discounts to online students regardless of their location. Policies vary between schools, so visit the tuition & fees page for details. Worried about the reputation of an online program in fine arts? Find out where the university is located and then have a look at our Online State Rankings. Under each state, we have flagged Online Schools with Accreditation & Quality Concerns. The following universities appear in our rankings of Top Affordable Schools for Fine Arts and Top Online Schools for Fine Arts. That means they have met some extremely tough criteria for quality, flexibility, price, and use of financial aid money (you’ll see a CAG Score next to their profiles). The Department of Art administers IUP’s Blended MA in Art, but Graduate Tuition & Fees are handled by the Office of the Bursar. IUP’s Office of Extended Learning also has a convenient roundup of Sample Total Costs for an online course. Because IUP is a public research university, Pennsylvania residents get a tuition discount! The Office of Financial Aid can help with graduate aid packages (e.g. federal student loans). The School of Graduate Studies and Research also funds opportunities for graduate research (e.g. travel to conferences, professional development opportunities, etc.). Students considering Mansfield University of Pennsylvania’s Online BA in Art History (a degree completion program) can find tuition rates and financial aid information listed in the Registrar, Student Accounts and Financial Aid section. Residents of Pennsylvania can take advantage of a substantial tuition discount! Need advice on your credit transfers? Visit the section for Transfer Students. Military or veteran? Check out the section on Military and Veteran Educational Benefits and the Mansfield Military Scholarship. Mansfield also offers an assortment of general institutional scholarships, though none that are specifically intended for art history students. Radford’s Online MFA with a concentration in Art Design Thinking and its Online Graduate Certificate in Design Thinking fall under the auspices of the Department of Design. The Office of the Bursar has a rundown of differential tuition & fees—the per credit cost of the Online MFA for residents & non-residents is roughly equivalent, but in-state students don’t have to pay the mandatory out-of-state capital fee. The Office of Financial Aid has specific advice for graduate students; and the section on MFA in Design Thinking FAQs has answers to questions about tuition reimbursement programs. UF Distance Learning has full descriptions of its NASAD-accredited programs—including the CAEP-accredited Online MA in Art Education, the Online MA in Arts in Medicine, and the Online Graduate Certificate in Arts in Medicine. All three programs are administered by the College of the Arts. Current tuition & fees for graduate programs are posted by the Office of the Bursar; Florida residents receive a substantial tuition break on the MA in Art Education. However, there is a fixed per credit tuition rate, regardless of residency, for the Arts and Medicine programs. Costs are outlined in the Applications section. Looking for funding options? The Office for Student Financial Affairs can assist with financial aid applications and UF’s Scholarship Search includes both UF and private scholarships. The UF does not provide financial aid for graduate certificate programs, nor is federal aid available. We recommend that you opt for schools that hold regional accreditation. In addition to traditional universities and colleges, Colleges of Art & Design, Art Institutes, and Academies of Fine Arts can also be regionally accredited. Regional accreditation is granted to an institution, not an individual department or program, so it covers both on-campus and online degrees. Why do we make this recommendation? Earning an online qualification from a regionally accredited institution will make it easier for you to transfer credits; qualify for federal aid; apply for student loans, scholarships, and tuition reimbursement; and gain acceptance into graduate programs. Many regionally accredited schools will not accept credits from nationally accredited schools. The National Association of Schools of Art and Design (NASAD) is one of the most common acronyms you’ll see on art program websites. NASAD establishes national standards for undergraduate programs, graduate degrees, and related credentials in Schools of Art and Design. It accredits universities & colleges with Schools of Art and post-secondary non-degree-granting Schools for Visual Arts. It’s important to note that NASAD is happy to accredit institutions that offer online programs (e.g. University of Florida). So feel free to use this accreditation as a quality marker when you’re comparing distance learning degrees. Search for NASAD-Accredited Institutional Members. In addition to NASAD, some specialized colleges of art and design have also elected to become members of the Association of Independent Colleges of Art and Design (AICAD). This is a non-profit consortium of art schools in the U.S. and Canada (e.g. Colleges of Art and Design, Art Institutes, Academies of Art, etc.). Membership is open to schools that are private, non-profit, free-standing, BFA and/or MFA degree-granting and accredited by NASAD and the appropriate regional accrediting agency. There are AISAD schools that offer hybrid programs. For example, Pennsylvania Academy of the Fine Arts has developed a low-residency MFA. If you’re planning to become an interior designer, the Council for Interior Design Accreditation (CIDA) is worth knowing about. It accredits undergraduate programs, and some graduate programs, in interior design. Attending a CIDA-accredited program is an easy way to demonstrate educational competency in most states and provinces that regulate interior design. The Council for Interior Design Qualification maintains a list of State Regulatory & Licensing Boards that handle interior design regulations. Many interior designers with a degree aim for the National Council for Interior Design Qualification (NCIDQ). You do not need to graduate from a CIDA-accredited program to sit for the NCIDQ exam, but it will demonstrate that you’ve fulfilled the education requirements. CIDA is willing to accredit distance learning programs if the program meets CIDA standards and eligibility requirements. Many accredited hybrid programs also include courses that are delivered or supported through online learning environments. View a List of CIDA-Accredited Online Programs. Would you like to teach art in a K-12 public school? You must have a state teaching license. (Private schools may not require licensure, but they’ll generally expect you to hold a degree.) We talk about the state licensure process and options for obtaining an education degree in our guide to K-12 Education Degrees. Be sure to check with your State Board of Education for details on earning your license. Many states have specific requirements (e.g. a state-approved bachelor’s degree, completion of a teacher preparation program, and passing scores on Praxis tests). All bachelor’s degrees leading to teaching licensure are going to be hybrid or on-campus, and will involve teaching internships and on-site components. Aspiring art teachers often choose an undergraduate major in education or art education. Some decide to earn a double degree in education and art. Already hold a bachelor’s degree and thinking about taking an alternative pathway to becoming a teacher? You may be able to find an Online Master of Arts in Teaching (MAT) that meets your State Board’s education requirements for state licensure. But, again, the program will include on-site components and teacher training in schools. Online MA in Art Education programs are typically aimed at art teachers who already have their initial teaching license. Some licensed K-12 art teachers will pursue a master’s degree in order to earn higher level certification/licensure or field endorsements. If this is your situation, there are online graduate programs that can help with this process. They’re rare, but they do exist. Indiana University of Pennsylvania’s NASAD-accredited Hybrid MA in Art fulfills the requirements for teachers seeking PDE Level II certification. If you have been teaching in Pennsylvania on a Level I certificate for 3-6 years of satisfactory service and have earned 24 post-baccalaureate credits, you can apply for a Level II certificate. On the other hand, the University of Nebraska Kearney explicitly states that its Online MEd in Art Education does not lead to certification or a field endorsement. According to the American Art Therapy Association (AATA), a master’s degree is required for entry-level practice in art therapy. On top of a degree, you may also need a state license or other credentials to practice. State Licensure: It’s important to know that some states (e.g. New York) have developed specialist licensing programs for art therapists. You’ll often see two acronyms: Licensed Creative Arts Therapist (LCAT) or Licensed Professional Art Therapist (LPAT) in these states. Counseling Licensure: In other states, art therapy can fall under the category of counseling. Some universities have created dual programs (e.g. MA in Counseling with a concentration in Art Therapy) that will also meet the requirements for a state’s Licensed Professional Clinical Counselor (LPCC) credential. ATR: Another credential to consider is the Registered Art Therapist (ATR) from the Art Therapy Credentials Board (ATCB). The ATR requires you to complete a qualifying master’s level program and post-education supervised clinical experience. There are online graduate programs that can help you toward these goals! For example, Edinboro University of Pennsylvania has an NASAD-accredited MA in Counseling – Art Therapy that can be completed 100% online or in a hybrid form. It was designed using American Art Therapy Association (AATA) guidelines and it meets the educational requirements you need to become a Registered Art Therapist (ATR) and a Pennsylvania Licensed Professional Counselor (LPC).